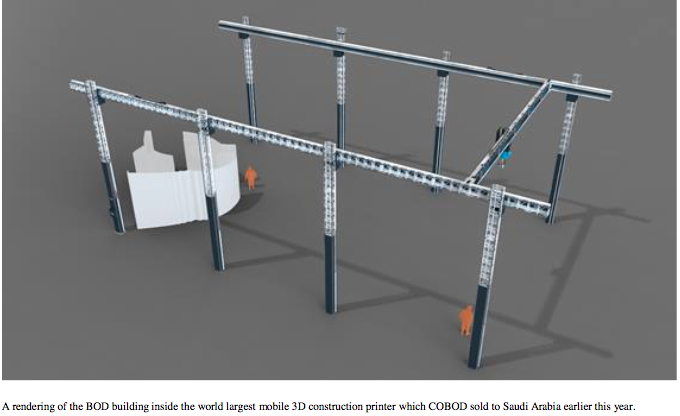 Danish firm Cobod International has announced it has signed Germany’s Peri Group as a distributor in Germany, Switzerland and Austria, bringing 3D construction printing to the mainstream construction industry. Cobod is most known for having 3D printed the first fully permitted building in Europe, the BOD in Copenhagen. COBOD said it is now looking to accelerate inroads into the global mainstream construction market even more. Peri Group is well known in the German, Austrian and Swiss formwork, scaffolding and construction markets with more than 20 locations in the three countries. "When we made the investment in Cobod last year we made it clear that we believe that the 3D construction technology of Cobod is ready for the general construction market,” commented Leonhard Braig, Member of PERI Group Management and responsible for Products & Technology. “Following the first successful delivery of Cobod’s high speed second generation BOD2 3D construction earlier this year to Belgium we are now following up on that, by making Cobod’s BOD2 printers available to all our German, Austrian and Swiss customers. Not only will we be selling the printers of Cobod, but we will also have large scale printers available for rent such that our customers will not have to invest in a printer themselves to try on this new and revolutionizing technology”.